Iranian filmmaker, photographer, video artist and poet Abbas Kiarostami will be in residence at SU for two weeks this spring as the College of Visual and Performing Arts’ (VPA) 2014 Sandra Kahn Alpert Visiting Artist. In late March, Kiarostami will conduct a workshop with VPA and SU undergraduate and graduate students, who will work with him to produce a short film. Six professional Iranian filmmakers from around the United States will also participate. Kiarostami will also present artist lectures and screenings in VPA’s Department of Transmedia and critique student work in various VPA graduate seminars. He will visit classes in the Maxwell School of Citizenship and Public Affairs’ Middle Eastern Studies Program and The College of Arts and Sciences’ Department of Religion. Kiarostami is the most influential and controversial post-revolutionary Iranian filmmaker and one of the most highly celebrated directors in the international film community of the last decade. He holds a degree in fine arts and has worked extensively as a screenwriter, film editor, art director and producer. He is also a poet, photographer, painter, illustrator and graphic designer. In 1969, he helped create a filmmaking department at the Institute for the Intellectual Development of Children and Young Adults in Iran. 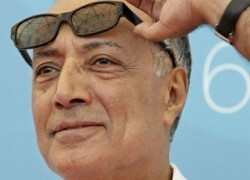 Kiarostami has made more than 20 films, including fiction features, educational shorts, feature-length documentaries and a series of films for television. He was awarded the prestigious Palme d’Or (Golden Palm) at the Cannes International Film Festival in 1997 for his film “Taste of Cherry.” He has directed two films outside of Iran: “Certified Copy” (2010) starring Juliette Binoche, who received the Best Actress Award at the film’s premiere in Cannes, and most recently, the Japanese language film “Like Someone in Love” (2012), set in Tokyo. a free screening on Tuesday, April 1, at 7 p.m. at Watson Theater, Watson Hall on the SU campus. a FilmTalks conversation on Tuesday, April 8, at 7:30 p.m. at the W. Carroll Coyne Center for the Performing Arts (the PAC) at Le Moyne College, sponsored by the Le Moyne College film program in collaboration with the Syracuse International Film Festival and VPA’s film program. Admission is $10; tickets may be purchased at the PAC Box Office or reserve a seat by calling the box office at 315-445-4200 or the film festival office at 315-671-2188.
a poetry reading on Thursday, April 10, at 6 p.m. at the Point of Contact Gallery in SU’s Nancy Cantor Warehouse, 350 W. Fayette St., Syracuse. a reception and double-bill screening on Friday, April 11, at the Palace Theatre, 2384 James St., Syracuse, sponsored by the Syracuse International Film Festival. Kiarostami will be honored with the festival’s Sophia Lifelong Achievement Award. The reception begins at 5:30 p.m., followed by the screening at 7:30 p.m. Tickets for the reception and screening are $40 and reservations are required. Reservations may be made by calling 315-671-2188 or emailing Christine@syrfilm.com. Tickets for the screening only are available at the door for $10. During his Syracuse visit, Kiarostami will be accompanied by his Iranian colleague and fellow filmmaker Adel Yaraghi. Owen Shapiro, Shaffer Professor of Film in VPA’s Department of Transmedia, is coordinating Kiarostami’s residency. Contact Shapiro at ojshapir@syr.edu with any questions about Kiarostami. The Sandra Kahn Alpert Visiting Artist Endowed Fund was established by Alpert, a 1945 alumna of VPA, and her husband, Clement Alpert, to bring leading artists and designers to campus for the purpose of engaging in direct interaction with art and design students and faculty.